To Sue, or not to Sue? That is the legislation. Whether 'tis nobler in the mind of our judge to sling thy gavel of outrageous fortune, or to take arms against a sea of thieves, and by prosecuting them, read them their rights while reading them the following comic book. It was created by Charles Soule, Alec Morgan, Matt Milla, and published by Marvel in September, 2017. Case dismissed. TO QUOTE Colonel Jessup: 'Son, we live in a world that has walls, and those walls have to be guarded by men with guns. Who's gonna do it? You?'. This is it, folks. This is finally it. With his best friend Foggy Nelson by his side, Matt Murdock is now ready to boldly walk into the Supreme Court and legally explain why superheroes should be allowed to testify in a court of law. But, as you'd expect, there are a number of predetermined obstacles barring his path, the first of which involves the villain Tombstone being requested to attack Matt while he's giving his opening statement. 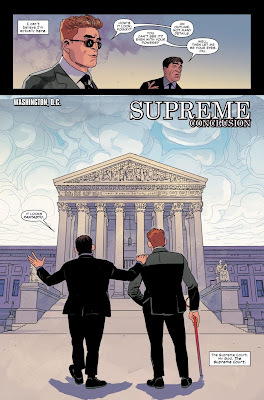 Mister Legal has also been hired to oppose Matt, verbally I might add, coupled with the fact that the Justices themselves need to bare witness to both sides of the argument so they can make a decision based on what they hear. Eventually, they do just that. But not before Matt delivers his final summation as to why he thinks he's in the right where as Mister Legal is in the wrong. And on that note, dear reader, I don't think I can say any more or else I may spoil the concluding part of this story-line. Apart from the fact that I did enjoy reading it, largely due to the following four reasons! Reason One) LEGAL SPEAK: As we all know, Daredevil is generally known as 'The man without fear'. So to my surprise I was gladly taken back when Matt used the notion of fear as a basis for his legal argument. In no uncertain terms Matt was able to distill this emotion to its essence by presenting fear in a more positive light. On average most people perceive fear as being a negative emotion, yet it can also be a positive one, but only if we try to educate ourselves in the unknown, therefore making the unknown, known, thus less threatening. Reason Two) GROOVY JUDGES: Something else about this book I really enjoyed was that transitional scene depicted halfway through it. It was the one in which Matt internally visualizes himself fighting the Justices and Mister Legal within a psychedelic dreamscape. From my point of view this was one of those scenes that took me by surprise because at first glance I wasn't quite sure if it was real or not, even though it did punctuate the notion that this fight is a true fight despite not being a physical one. Stylistically this scene also became more edgy the longer it played out, and in many ways it highlighted Matt's dual battle -- one with the court, the other in the streets. Reason Three) TOMB GROAN: Now without giving too much away I did enjoy how Tombstone was utilized in this adventure. Initially I presumed he was going to follow the same path he took in the previous two episodes, but, thanks to Charles Soules' clever writing, no, this wasn't the case, and gratefully so I might add. Although, I must confess, I am slightly curious as to what will happen to him the next time he shows up in this series, particularly if the Kingpin finds out, wink-wink! Reason Four: ART ATTACK: I'm afraid to say that I was fairly indifferent with Alec Morgan's illustrations. On the one hand his layouts did seem slightly too immature and sparse by design, whereas on the other, sometimes he was able to capture the majesty and the importance of what is basically a talking heads story-line, which, by no means, is an easy feat for a conclusion. So with all that said, all I have left to say is that overall this was a pretty above average issue of Daredevil. Its main saving grace was the story, even though it was slightly let down by the art. The main brunt of this adventure is about a legal man trying to change the judicial system. So with that in mind, what's stopping me from musically matching it up with that groovy song by Belle & Sebastian, 'Legal Man? Nothing I suppose! Do you remember that famous scene depicted in the 1939 Frank Capra classic, 'Mister Smith goes to Washington'? It's the one where the title character, as played by James Stuart, stands up and tells his fellow Senators about what he thinks is wrong with the political system. If so, then you probably have a pretty good idea about what I'm going to compare this comic book to. 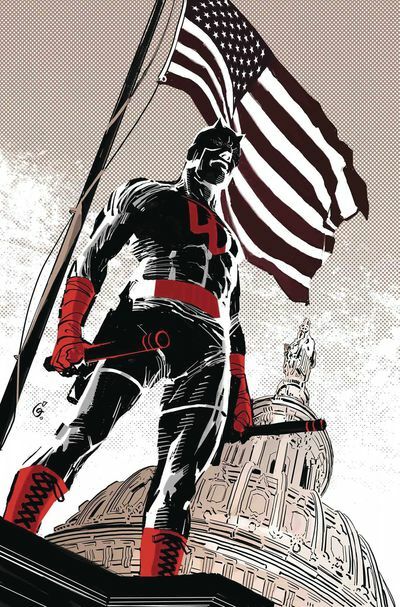 'Mister Murdock goes to Washington'? Yeah. That sounds about right, albeit slightly too passive. As a blind man, maybe I can see it. As a redhead, maybe I can dye it. As a catholic, maybe I can bless it. As a cleaner, maybe I can bleach it. As a lawyer, maybe I can fix it. As a vigilante, maybe I can beat the sh@t out of it. As a lefty, maybe I can pick it up incorrectly. As a git, maybe I can call it names.